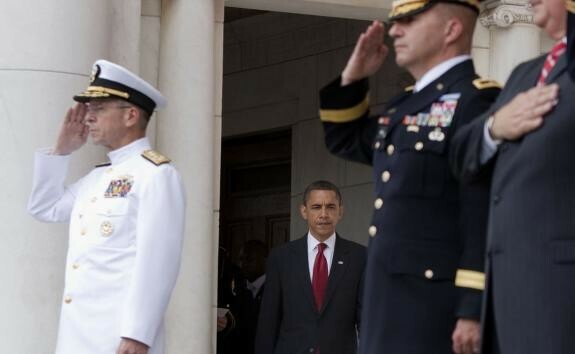 President Obama Failed to Salute at Veterans Day Service-Fiction! - Truth or Fiction? 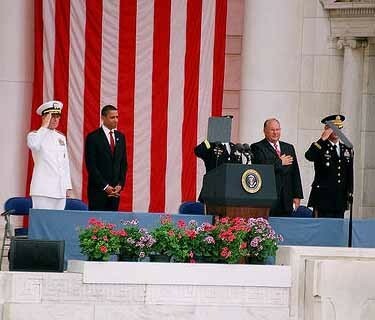 President Obama Failed to Salute at Veterans Day Service- Fiction! 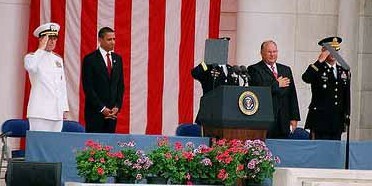 President Obama Failed to Salute at Fort Hood Service- Fiction! This is a forwarded email with an attached photograph that says President Obama did not salute while attending the November 11, 2009 Veterans Day memorial service at Arlington National Cemetery in Virginia. Other versions of this email suggest that the photo was taken during the Fort Hood Memorial Service after the attack on the US Army Base in November 2009. The photo in question is from a privately owned web site dedicated to our Nation’s fallen buried at Arlington and was taken during the Memorial Day service at Arlington on May 25, 2009, not Veterans Day. Click here for Arlington.net web site. Arlington.net Webmaster Michael Robert Patterson told TruthorFiction.com that the photo was taken as the president was entering the ceremony stage at Arlington. Traditionally, the President walks in to the tune of “Hail to the Chief” as military personnel salute their Commander in Chief. The civilian on the stage with his hand over his heart is Arlington’s superintendent of 19 years, John Metzler Jr. Patterson told Truthorfiction.com that Metzler has always made it a tradition to salute the President in this manner at Arlington events. Below is a side by side comparison of two photographs from different angles showing the President entering the stage area to the tune of “Hail to the Chief” and the photo on the right shows him standing reverently as the tune finishes. Video of this event is available at the C-SPAN site. President Obama’s entrance can be found at about 11 minutes into the video presentation. It is followed by a prayer and the singing of the National Anthem where Obama can be seen putting his hand over his heart at the introductory announcement. Click for C-SPAN video. 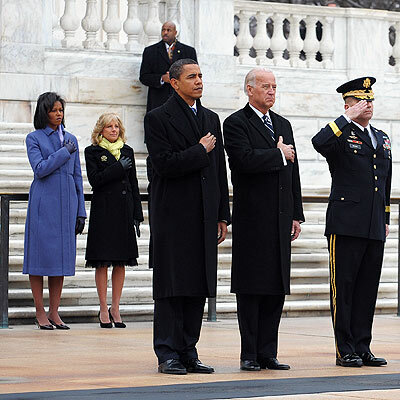 President Obama and Vice President Biden did attend the November 11, 2009 Veterans Day memorial. Below is a photograph showing the President and Vice President as they salute at the Tomb of the Unknowns at Arlington. Click here for video of Arlington Ceremony. Check out this latest picture from WEDNESDAY, Veterans Day 11/11/09 at the Ceremony in Arlington National Cemetery. I don’t know whether the National Anthem is being played, or the Flag is going by, or WHAT, but EVERYBODY in the picture is either saluting or has his hand over the HEART. All except ONE. Guess who??? And some people actually call him our President!!!??? You would think he could, at least, fake it. The POTUS at Ft. Hood , Nov. 11, 2009…”honoring” the 14 dead (an unborn child…not a fetus…was the 14th!) at the hands of a Muslim home grown terrorist!! !